Listeria bacteria can be used to combat cancer by delivering radiation selectively to tumour cells, new research has revealed. Pancreatic cancer is a highly aggressive form of the disease, with only 4% of people surviving longer than 5 years after diagnosis. 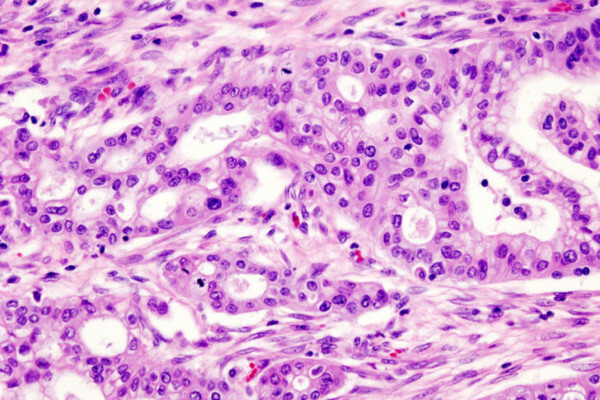 This is often due to the cancer spreading - or metastasising - around the body before it is detected. Now, Claudia Gravekamp and her colleagues at Albert Einstein School of Medicine in New York have found that the bacterium Listeria monocytogenes, which multiplies inside cells, preferentially infects cancers compared with normal tissue. This occurs, the team think, because cancers release immune-suppressing signals into their immediate environment. Realising that cancer-targeting behaviour could be employed to selectively deliver anti-tumour agents, Gravekamp's team used antibodies to glue radioactive particles to the surfaces of the bacteria. Injected into the abdominal cavities of mice with metastatic pancreatic cancer, the radioactive Listeria accumulated inside the cancerous cells, delivering a lethal dose of radiation and killing off 90% of the tumours. This kind of treatment for cancer, called targeted radionuclide therapy, has been tried before using radioactive antibodies, but according to Gravekamp, the advantage of attaching them to bacteria is that a higher dose of radioactivity in the tumours can be achieved. Normally, Listeria infection is associated with food poisoning, and can lead to fever and diarrhoea. To get around this, Gravekamp and her colleagues used a weakened strain of the bug, which lacked several genes necessary for it to cause disease. "The 'flu-like side effects of the attenuated Listeria are mild compared to the aggressive chemotherapy currently used to treat cancer," Gravekamp points out. Looking ahead, Gravekamp goes on to say that eventually she plans to trial the technique in humans, but there are some hurdles to overcome first. "Listeria may kill 90% of the metastases and 64% of the primary tumour, but any tumour cell left can still divide and cause the cancer to spread again. We hope that by using radioactive particles with longer half-lives, as well as using different methods of attaching the radioactive particles to Listeria, and different treatment protocols, we can improve the hit rate to 100%."